Oh, how I enviously look upon those trendy people wearing their blingified trendy FitFlops every where I look..... in the park, queuing at the supermarket till or traveling through the Airport. How easily they can be worn to dress up or down an outfit. Don't they look so good? That's all very well for those who like to flip flop in style but what if you're like me? What if you cannot wear Flip, or even Fit, Flops? What if you simply cannot abide things... or thongs... between your sensitive little tootsies? What then? Seriously? That's it? 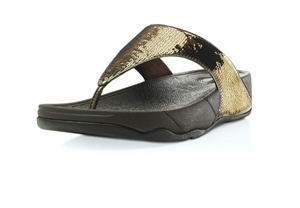 Come on Fitflop, surely you can offer us non-toe-thong wearers a better, more blingified alternative? It's not rocket science. You could still follow your trademark design of starting at the back of the shoe giving a deep V at the front you know. Instead of two bands going straight across you could have them crisscrossing .... and BLINGIFY them. For example, no.1 alternative could have been made nicer material with some bling attached. Ya don't gotta save all the jazzy material for thong toes folk ya know! Why are us non-thong wearers subjected to boring, brown 'mammy' alternatives? 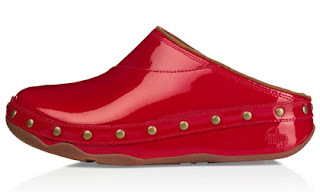 Patent leather clogs really don't cut it with me either! Seriously folks, I have been studying this since last summer and have also viewed this summer's offerings here in Ireland, and unfortunately I can see no real differences. Except a €20 hike in prices for FitFlops that is. 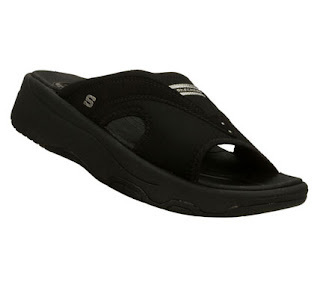 Dear FitFlop: there is a recession on, in case you haven't noticed. 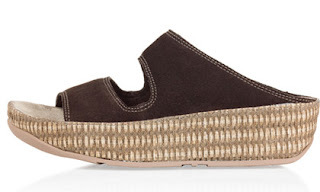 I am totally fed up of going into numerous shops and being confronted with a wall-to-wall presentation of trendy flip flops with only a small section of slip-on footwear for non-thongers such as myself. Personally speaking I think it is time for us non-toe-thong wearers to stand up and be counted, so to speak. Are ye with me, or agin me??? Are you ready to stand up in your non-blingified non-toe-thongs and be counted? Are you ready to join with me and say.... Blingify me?! Seriously, I reckon that this is a definite opportunity for shoe manufacturers to fill a niche market. No one else is doing it. If FitFlops, sketchers or ANY interested shoe manufacturers are reading I'd be more than happy to try out any prototype you have to offer and to review it here for all to read. I'm in your corner Jazzy :) I have a pair of barely-worn Fitflops that I don't find comfy and only wear flip flops if the temperature is over 25 degrees ! Me and hot weather just do not work, unless I'm on the beach of course! @Blue Sky: Lol! I seriously can't even put them on! I tried, really tried to put themon in a shop last year. I did it but was nearly hyperventilating! I suddenly got how are kids feel about toe nail cutting or seams in socks! 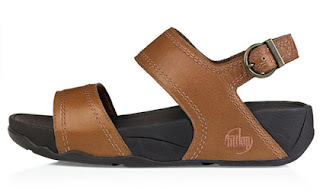 The non thongs do seem to be trying to out-lesbian Birkenstock. Yes, their design teams could definitely do better in that area! My daughter gets cheap flip-flops and then gets poofy flowery barrettes and attaches them to the top of the flip-flop. She's going to be a designer!!! Totally agree! I have dowdy alternative fit-flops which are very comfortable but, as you say, no bling. Mu mum came out for a visit this week and I asked for fit-flops (intending to make a real efforet with the thong) but she didn't understand and bought thin-soled flip-flops instesd. Lots of bling but no support - they're going back. @Hammie:Hahaha...yes, they do! But... are Geox wedges tone-ups?? See, I'm standing up for all us non-toe-thongers who want cool and trendy tone-ups with a bit of bling! I cannot axcept that it's not possible! @Tanya Savko: Thank you for agreeing! @Lizbeth: Don't mention the green crocs! Mind you they're still here. Right...that's your daughter roped in on our design team!! @Midlife Singlemum: Yay!! Another one on my side!! EEk...you're right to send them back! You know you can get gel thingies to put between your toes (even typing that gives me the heebie-jeebies!!) to help make them more comfortable? What drives me crazy are the blinged out flip flops in the Victoria's Secret catalog that cost 50-80 dollars! YES!!! I'm so with you on this! I can't tolerate flipflops between my toes, but they're so cute. Sigh. @Emma: Klip klaps...that is hilarious! Yes, they're pretty ugly, aren't they? I do hope some fitflops designer is reading..... hint hint! @Apples and Autobots: Excellent!! Another one who agrees with me! Hilarious. Count me in too; I desperately need blingifying. I have struggled with flipflops with those things between your toes for years and have resorted to wearing boring safe sandals. @Deb @ aspieinthefamily: And another one! EXCELLENT!